Now she doesn't have to wait on you to throw the ball. Keeping Bella occupied when you're busy is no easy task, but if your dog is one who flips out over fetching, a ball-throwing machine might be just the thing she needs. The machine gives her exercise and mental stimulation when she's in the mood to play but you aren't. A ball-throwing machine has a receptacle on top and a shooting mechanism in the front. When you or your pup drops a ball in the receptacle, it travels down to the shooting mechanism and is propelled out of the machine for your dog's fetching enjoyment. Most hold multiple balls that release several seconds apart, or you can choose for the machine to be dog-driven. When Bella drops in a ball, it shoots out, giving her control of when and how long she plays. 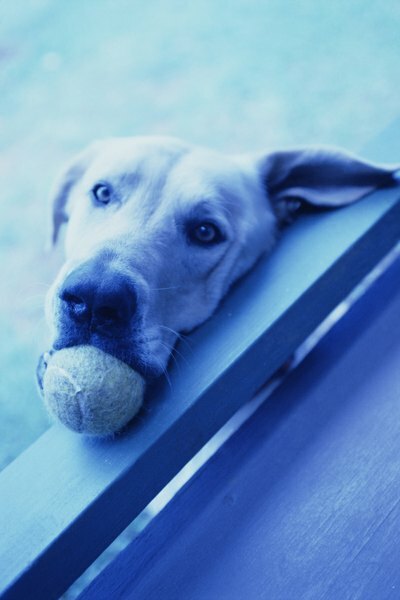 If you already play fetch with your dog, you're halfway through the training process already. Show Bella how to drop a ball in the receptacle and where to stand afterward; she should be at least 2 feet from the machine. When the ball shoots out, praise your pup for returning the ball. She's likely to give it to you first, since that's probably her routine. Instead of taking the ball, walk her to the receptacle and tell her to drop it in. This takes some repetition, but she'll get it. If you've never played fetch, start by tossing the ball short distances and giving her treats when she brings it back. Ball-throwing machines don't spit out balls at a million miles an hour, but getting hit with the ball could sting a bit. Don't allow the ball to release until she's set in the spot you teach her, at least 2 feet from the machine. If Bella's having trouble backing away after dropping off the ball, don't allow her to play unsupervised. Some machines include a sensor that won't release the ball if there's a body -- yours or hers -- that's too close. The joy of having a dog comes from that unconditional interaction. Your pooch would always rather play with you than with a machine, but you can do both. Set your machine to be owner-controlled, then stay outside and send off the balls for Bella. This gives your throwing arm a break; some models have remote controls, allowing you to relax in your lawn chair, launch the balls and call encouragement to your dog. Awesome Dogs: How Do I Teach My Dogs to Play Fetch? How Old Are Cats When They Pass Away? What Kind of Coat Does an Australian Shepherd Have?